VMware is the global leader in virtualization solutions from the desktop to the datacenter—bringing cloud computing to businesses of all sizes. VMware virtualizes computing, from the data center to the cloud to mobile devices, to help our customers be more agile, responsive, and profitable. 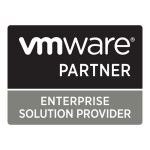 Customers rely on VMware to reduce capital and operating expenses, ensure business continuity, strengthen security and go green. Hyper-Converged Infrastructure (HCI) leverages the hypervisor to deliver compute, networking and storage from a single x86 server platform, creating a tightly integrated, building block approach to IT infrastructure. HCI allows datacenters to operate with agility on a highly scalable, cost-effective infrastructure that delivers enterprise-class performance, numerous deployment choices, end-to-end integration and lower TCO. VMware virtualization management solutions are optimized for vSphere environments, heterogeneous and hybrid cloud, as well as the traditional and cloud-native applications they support. With infrastructure designed for secure delivery of cloud, mobile, social and big data applications, IT can be more flexible and respond to business requests quickly. Get storage-level granularity with integrated storage management and analytics. Ensure availability with integrated network management. Get full visibility with an open platform supported by third-party management packs. Business Mobility is the core of innovation. It gives organizations the power to be more competitive. Your business can work more effectively – and connect with customers in ways that once seemed impossible.